Traditional houses crammed together on a series of jetties linked by wooden walkways perch on stilts over the sea. These are George Town’s Clan Jetties. Built in the 19th century, communities of fishermen, traders and dock workers still live with their families on these austere clan jetties along the shores of historic George Town in Penang, Malaysia. A few hours exploring by foot along George Town’s clan jetties was one of the highlights of my short trip to Penang. I love waterside living and these simple homes appealed to me. Each clan jetty is unique in character, some more rustic and unkempt than others. Here’s a series of some of my images captured that afternoon. 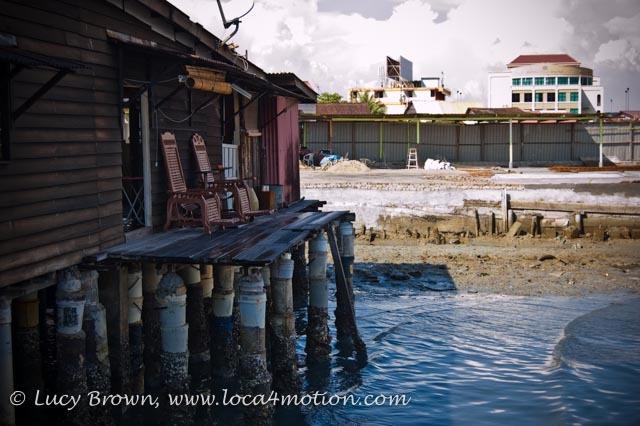 Check out my earlier post Penang Snapshots: Historic George Town Scenes. A gaudy Chinese temple dominates the entrance to the workmanlike Chew Jetty. Bathed in bright sunlight blue boats moored along the boardwalk, rock lazily on the tide. Chinese lanterns, bamboo birdcages and handmade fish traps hang outside humble homes, cozy stores and simple eateries. Laundry hangs drying under eaves, bicycles lean against walls and motorbikes stand among the clutter of everyday living. Fragrant incense glows at the seaward tip of the jetty in a Chinese shrine with a sea view. The most basic jetty I walked along had no name at the entrance. I ended up staying a while, prisoner of a sudden storm. Luckily I found a broken plastic chair to sit on under an open-sided shelter full of fishing nets, my view misted by stinging rain; a ramshackle jetty village perched on stilts over a low tide stream clogged with tangles of broken logs, like skeletal remains emerging from the dark, stinking mud. As the rain subsided, I continued to the neater, homier Lee Jetty. A small Chinese shrine protects the entrance leading to an avenue of crimson Chinese lanterns, green wheelie bins, street lights and gaudily painted door and window frames with matching metal fences outside. A muddle of antennas, cables and satellite dishes hang overhead. Offerings lay at simple Chinese shrines guarding each house. Bundles of incense glow in sacred pots placed on the boardwalk end, facing seaward towards the city skyline and a yellow jetty temple across the water. More exploring at George Town’s Clan Jetties awaits me next time I visit Penang! This entry was posted on October 13, 2013 by loca4motion. It was filed under Malaysia and was tagged with chew jetty, chinese lantern, chinese temple, clan jetties, fish trap, george town, georgetown, jetty home, jetty village, lee jetty, malaysia, penang, photography, travel. Really great set if photos! The jetties are so cool! I’ve never seen them before. Are they mostly typical to Malasia only?